Publisher: Villard Books, Westminster, Maryland, U.S.A.
Catherine Blake is the model war widow. Ever since she lost her RAF pilot husband in the Battle of Britain, this beautiful aristocrat has kept a stiff upper lip while caring for victims of the blitz in London's hospitals. The problem is that Catherine Blake is also a deep-cover Nazi spy, charged by Hitler with uncovering the details of D-Day.<br /><br />Her nemesis is Alfred Vicary, a fumbling professor of history barely able to remember where he placed his threadbare tweed jacket, let alone sustain a relationship. 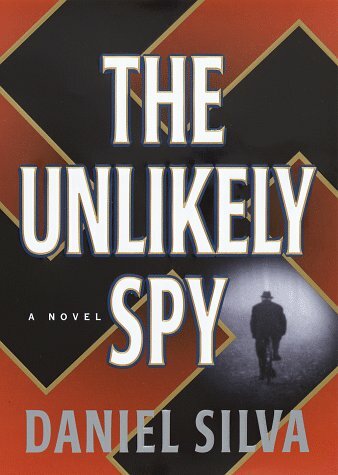 But Vicary is also a confidant of Winston Churchill's, who has chosen this reclusive don to run England's critical counterintelligence operations.<br /><br />Against this backdrop comes Daniel Silva's <b>The Unlikely Spy</b>, a sophisticated and altogether exceptional World War II thriller. Based on fact, Silva's fast-paced novel moves effortlessly from the Berlin High Command's espionage centers to the U-boat-infested North Sea, from the privileged playgrounds of Long Island to Hyde Park's shadowy paths -- a grand canvas of intrigue that sweeps the reader along in a breathtaking race against time. If Catherine escapes to Germany, the Nazis will know the Allied invasion will be at Normandy; and if Vicary doesn't stop her, all of Britain's greatest wartime deceptions and ploys will have been for naught.<br /><br />But why does it seem as if Vicary's superiors want him to fail?<br /><br />For lovers of Jack Higgins, Frederick Forsyth, and Len Deighton, <b>The Unlikely Spy</b> is a masterpiece of war and deception, a wholly original and spellbinding tale of the Allies' finest hour. In this debut novel, veteran journalist Silva mines the reliable territory of World War II espionage to produce a gripping, historically detailed thriller. In early 1944 the Allies were preparing their invasion of Normandy; critical to the invasion's success was an elaborate set of deceptions--from phony radio signals to bogus airfields and barracks--intended to keep Hitler in the dark about when and where the Allied troops would arrive. Catherine Blake is the beautiful, ruthless spy who could bring the whole charade crashing down; Alfred Vicary is the brilliant but bumbling professor Churchill has tapped to protect the operation. Along with a teeming cast of other characters, real and fictional, they bring the chase to a furious and satisfying climax.